The origins of the pretender Perkin Warbeck are not known for sure. Historians have used information from the confession he made in 1497 to piece together his early life. Perkin Warbeck stated that he was born in Tournai in 1474, the son of a poor burgess, Jehan de Werbecque and his wife Katherine de Faro. Local records in Tournai show that a Jehan de Werbecque did live in the city at the time of Warbeck’s birth. In 1491 Warbeck, a silk merchant’s apprentice, landed in Ireland. 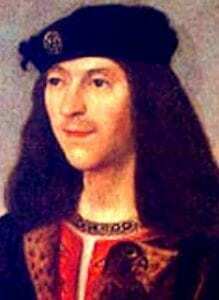 He claimed that he was recognised as Richard Duke of York, the the younger of Edward IV’s sons. He quickly gained notoriety and in 1492 Edward IV’s sister, Margaret of Burgundy, invited him to her court where she acknowledged him as her nephew. In France, King Charles VIII also acknowledged him as Richard, Duke of York, son of Edward IV. 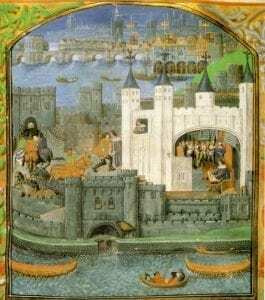 In 1493 Warbeck was in living in Antwerp as Richard Duke of York. With the aid of his ‘aunt’, Margaret of Burgundy he began to amass an army. In 1494 he was proclaimed the rightful King of England by Maximilian I, Holy Roman Emperor. By the Summer of 1495 Warbeck had amassed an army of 2,500 men and had 14 ships at his disposal. Before launching a full-scale invasion of England he decided to see what reception he would get from the traditionally rebellious county of Kent. He sailed his ships to Deal in Kent and anchored offshore before sending a few men to shore. The invaders were quickly rounded up by the Sheriff of Kent and Warbeck decided to sail to Ireland. Three weeks later, on July 23rd, Warbeck reached Waterford in Ireland. Waterford was traditionally a Royalist city so Warbeck placed it under siege. The siege failed and Warbeck marched to Cork. Having failed to gain much support in Ireland Warbeck decided to sail to Scotland. Perkin Warbeck landed in Scotland at the end of November and was given a state welcome by King James IV. He was also fitted with lavish clothes and entertained like a king. To show his support for the Pretender, James IV offered Warbeck the hand in marriage of Lady Catherine Gordon, the beautiful, rich daughter of a Scottish nobleman. In September 1496 James IV invaded England in support of the Pretender. He hoped to gain support from the Northern counties and march on London. However, the Northumbrians did not join the Scottish army and they retreated to Scotland. Henry VII called for the English parliament to raise money through taxation to strengthen defences along the Scottish border. The new tax was not popular and caused a revolt by the Cornishmen who said they were too far removed from Scotland to have to pay for the defence of the border. 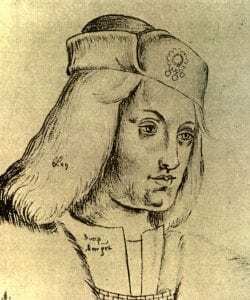 In July 1497 Henry VII issued an ultimatum to James IV of Scotland stating that if he did not surrender the Pretender Perkin Warbeck the two countries would be at war. James IV did not want war with England and decided that since there had been little English support for Warbeck he would be better making an alliance with England. He did not surrender Warbeck to Henry but instead provided him with a boat and told him to leave Scotland. Warbeck returned to Cork in Ireland where he received some support. In September 1497 he decided to utilise the unrest in Cornwall and landed at Whitesand near Land’s End in Cornwall. On 10th September 1497, the people of Bodmin proclaimed him King of England. Warbeck marched on and a week later lay siege to the town of Exeter. Unfortunately he was beaten back with a loss of 500 men. Soon afterwards he learned that a Royal army was stationed nearby so he took a few trusted men and rode for Southampton hoping to find safe passage back to the continent. Upon reaching Southampton Warbeck found a manned fleet in port awaiting his arrival. He fled again but was captured at Beaulieu on 5th October. Warbeck confessed to being an impostor and begged forgiveness. He was imprisoned in the Tower of London. In the Summer of 1498 Warbeck escaped from a window in the Tower and made for the coast. He tried to run but soon realised it was impossible. After surrendering to the abbot of the monastery at Sheen he was returned to the Tower of London. Edward IV’s nephew, the Earl of Warwick was also imprisoned in the Tower of London. Warbeck secretly wrote letters to him but they were discovered. The letters revealed that the pair planned to escape and overthrow the King. Warbeck could not be tried for treason because he was a foreigner. Instead he was charged with escaping imprisonment and sentenced to death. The Earl of Warwick was found guilty of treason and was also sentenced to be executed. Perkin Warbeck was hanged at Tyburn on 23rd November 1499 and Warwick was beheaded five days later.